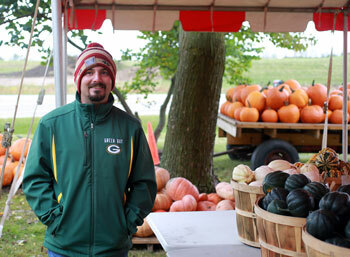 Family owned since 1946, Griffiths Grounds celebrates our 8th season providing homegrown fall produce and decorations to southeastern Wisconsin and northern Illinois. Open 7 days a week from 7am to dusk through October 31st; most any day and in any kind of weather you will be greeted with a smile by our farmer and stand manager, Ben Griffiths. In early summer, Ben and his family get together for a weekend of working the ground and planting the fields. Ben spends his summer weeding, watering, and caring for the pumpkins, gourds, and squash that he proudly spends his fall days picking. He would be happy to tell you which pumpkins and squash are good for baking or carving, as well as load your purchase into your vehicle. Griffiths Grounds offers a variety of carving pumpkins in all sizes, specialty decorating pumpkins, pie pumpkins, small and large gourds, several varieties of squash, cornstalks and decorating corn. Contact us for special orders! We have provided pumpkins and gourds for weddings, anniversary and birthday parties, landscaping companies, and school parties. Whether you love to decorate for the season, stock up on squash for the winter, or enjoy carving pumpkins with your family, Griffiths Grounds has something for you! While supplies last.